Next Day Delivery available to select GB postal codes. International Delivery from 2 working days. The bearish GRIZZLY 4 (4 Berth) comes packed with design and performance tweaks. 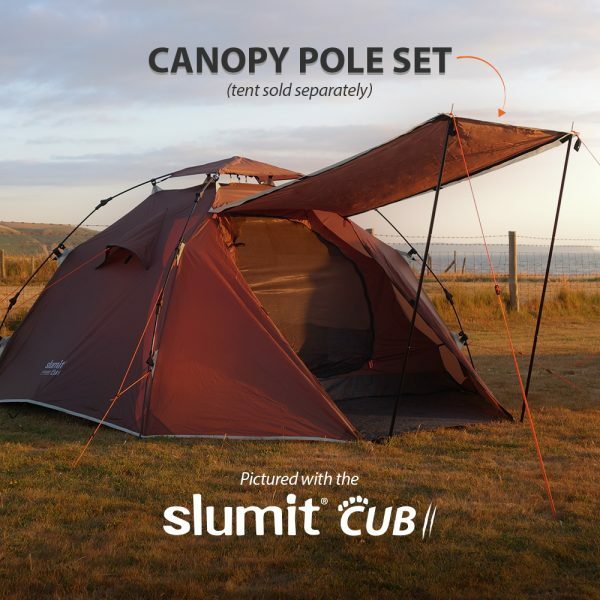 The GRIZZLY 4 is a high spec two layer tent with a waterproof and flame retardant (to CPAI-84) outer rainfly and separate bug-free, breathable inner sleeping area. 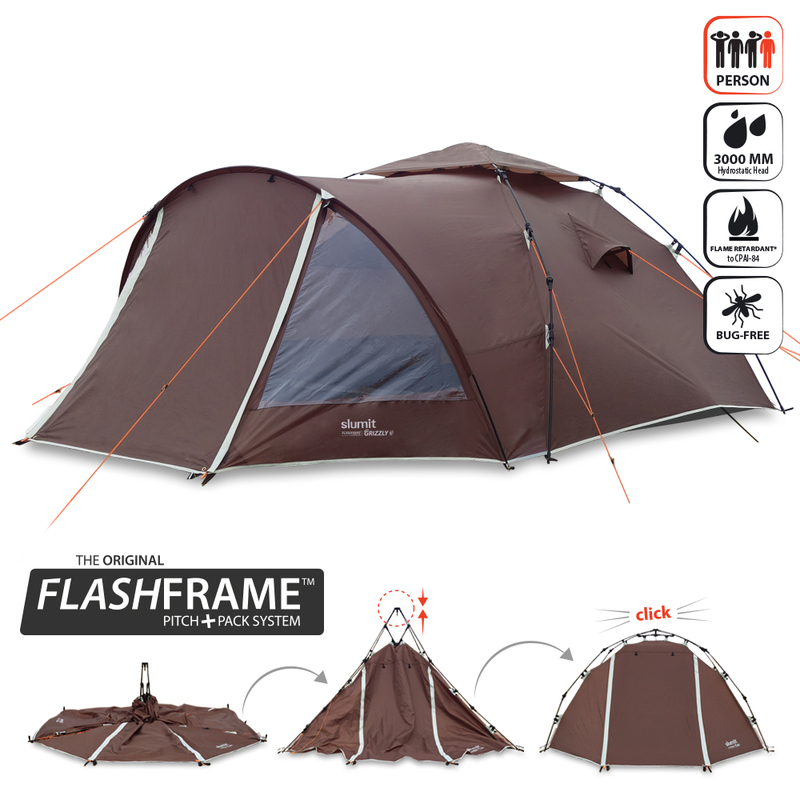 This 3 season camping tent can be pitched (and packed) faster than an equivalent pole and sleeve tent thanks to the original and innovative all-in-one FlashFrame™ Pitch + Pack System. Scroll down for the full feature list ..
*Dimensions and weights are approximates. Externals are overall dimensions. • Additional Poles are non FlashFrame poles. IE. Poles to create the vestibule / porch area. The FlashFrame does the rest. Additional Poles are supplied. • Berth refers to maximum number of people to sleep within the tent. The maximum capacity may be cosy subject to the size and frame of the camper(s) and gear stowed. • CPAI-84 Fire Retardant fabric does not mean the tent is fireproof. Fabric will still burn. Take caution when camping, not to use heat or flammable sources in or around your tent. • Air Vents help increase air flow into the tent and sleeping area. Keeping the air vents open will help reduce condensation. Closing the vents will help trap some of the warmer moist air but will increase condensation. Two PVC Windows with fully zippable internal privacy screens. Colour: Two tone Russet Brown with Ice White detailing. The bearish GRIZZLY 4 (4 Berth) comes packed with design and performance tweaks. 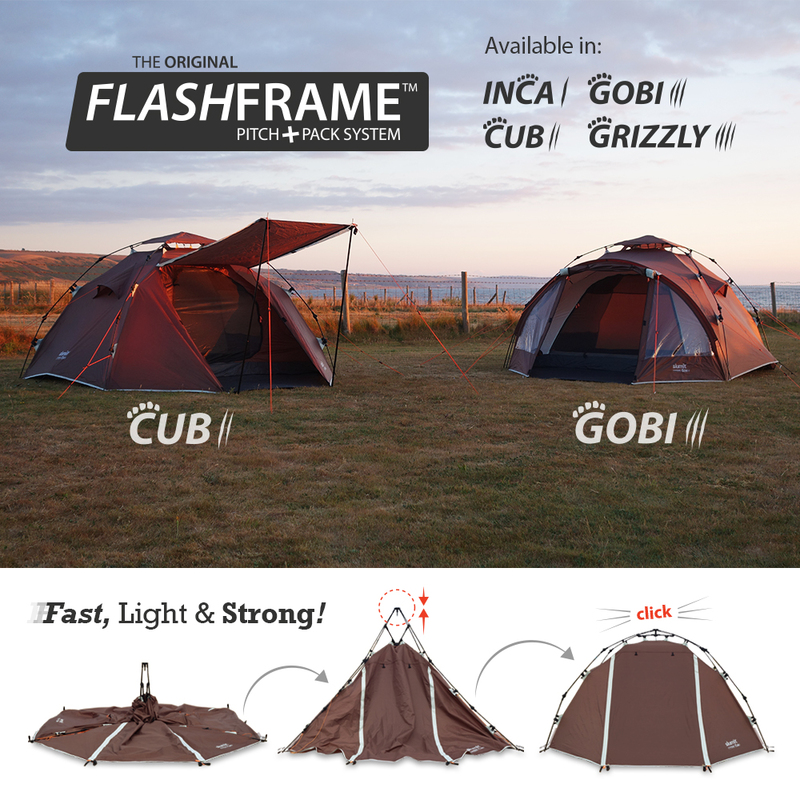 The second generation GRIZZLY 4 is a high spec two layer tent with a waterproof and flame retardant outer rainfly and breathable inner sleeping area. The rain-fly is waterproofed to a high 3000mm Hydrostatic Head (over 2.5x the British Standard for fabric to be deemed water repellant). The outer rain-fly is now flame retardant to CPAI-84 standard*. 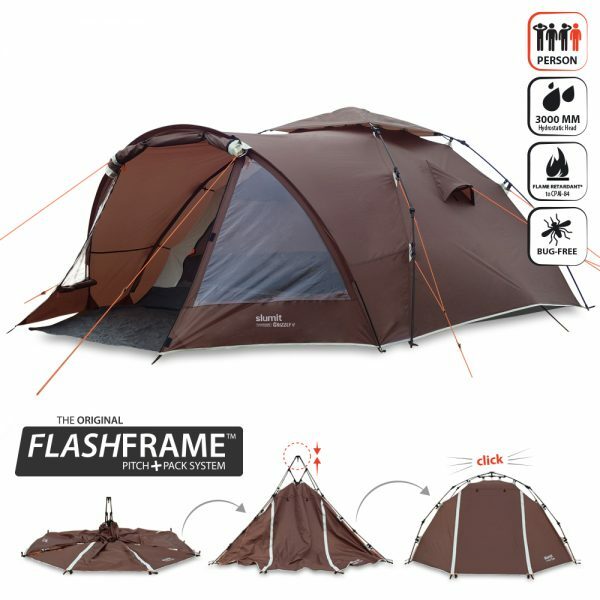 This 3 season camping tent can be pitched (and packed) faster than an equivalent pole and sleeve tent, thanks to the innovative all-in-one FlashFrame™ Pitch and Pack System. IMPORTANT INSTALL NOTE. The GRIZZLY by nature is a beast and it takes one to handle it! Due to the combined size and weightier FlashFrame™ system used on the GRIZZLY 4 (only), we recommend a minimum operator height requirement of 5’8″ (173cm) with good upper body strength. Otherwise users may find operating the GOBI FlashFrame™ challenging. Please contact us for advice, or consider the GOBI 3 FlashFrame™ tent as an alternative. 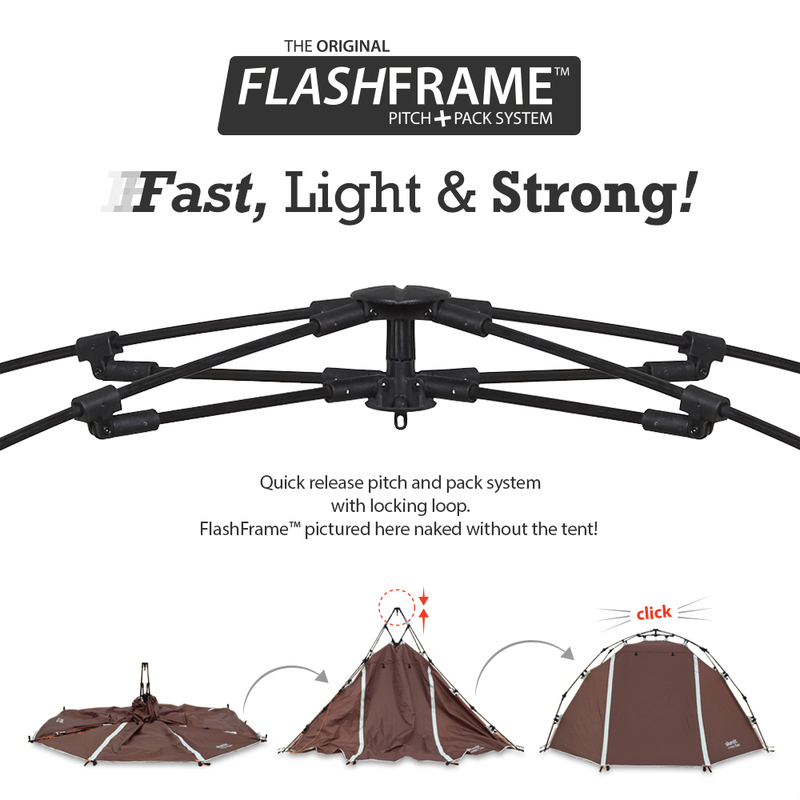 The FlashFrame™ is an exoskeleton frame system which enables the user to quickly pitch the inner and outer layers together, at the same time, in seconds. So no more pitching the inner tent first and then the outer, which can be time consuming and especially problematic during wet conditions. The FlashFrame™ solves this problem! *NB. The GRIZZLY 4 requires one fiber pole (supplied) to be threaded through the porch sleeve – the FlashFrame™ does all the rest! The GRIZZLY 4 offers a self contained bug-free sleeping area suitable for 3-4 persons. A separate roomy porch area suitable for campers needing sheltered storage for muddy boots and additional gear. The porch area is complete with two PVC Windows with fully zippable internal privacy screens – perfect for illuminating the inside of your tent especially on a rainy day! The internal Loft Storage Net and Side Storage Pockets (max load 2kg) are ideal for storing mobile phones, keys or other light weight accessories for easy access. “No-See-Um” mesh upgrade. Stonger and finer mesh holes than standard mesh, means even the tiniest of blood thirsty midgies (AKA “no-see-ums”) will struggle to get in. Ideal for areas with serious midge issues! Redesigned two point guy system to offer additional support and stability to the tent. FOOTPRINT GROUNDSHEET PROTECTOR – Increase the life of your tent and protect the underside of your integrated groundsheet from abrasion and general wear and tear by using a compatible FootPrint GroundProtector. Using a FootPrint Ground Protector helps increase ground insulation too. The FootPrint GroundProtector is tailored 10cm smaller than the integrated groundsheet to stop rain water channelling between the two layers. CANOPY POLE SET – Transform your outer front door into a canopy awning using the CANOPY POLE SET. Should be used on a still and ideally a dry day. Comes complete with foldable powder coated steel poles, guy ropes and pegs. 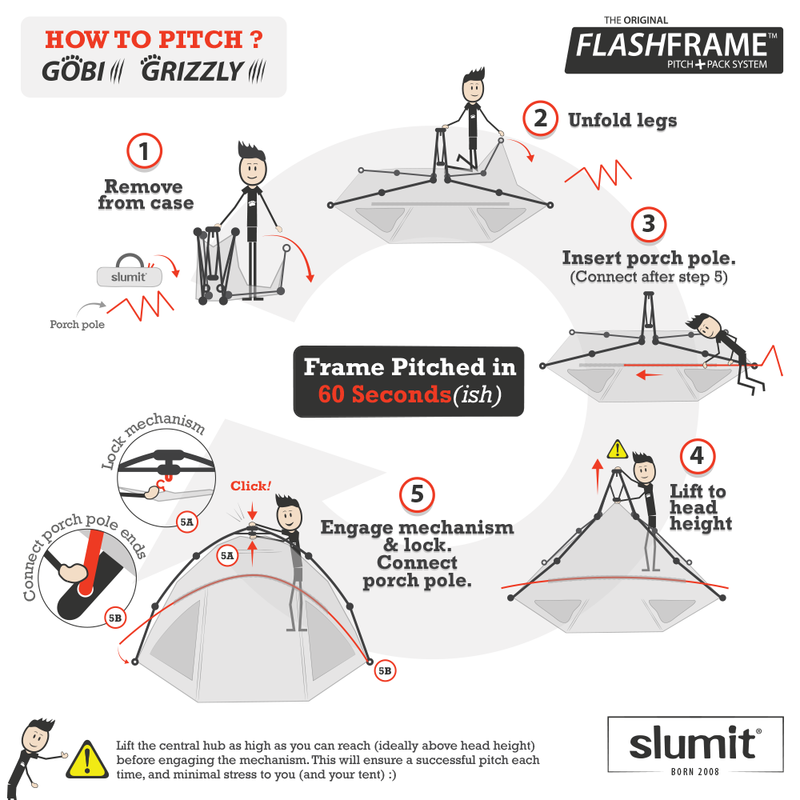 EXTRA GUY KIT – Reinforce your GRIZZLY tent using the Extra Guy Kit. Complete with 4 velcro banded guy ropes and heavy duty ground stakes. Fasten the velcro banded webbing to your FlashFrame system to offer increased stability and protection during windier conditions. Highly recommended if you are travelling away, or as a precaution should you experience unexpected inclement and breezier weather conditions. Ensure your tent is fully guyed out even on a still day. SAFETY NOTICE: Camping in windy conditions is not recommended and should be avoided for safety reasons. Check the recommended usage guidelines in the instructions. Always check wind and gust strength forecasts prior to your excursion. Winds may appear calm but gust strength may be very high. Wind and gusts can be extremely destructive and can damage temporary shelters such as tents and awnings not covered under warranty. *FIRE SAFETY NOTICE: A flame retardant fabric does not certify that the fabric or tent is fire proof. Fabric will still burn if exposed to a naked flame. Flame retardant fabrics will only reduce the rate in which fabric will ignite and burn. Great care should always be taken when camping. Keep heat sources away from the tent. In the event of a fire, evacuate the tent immediately. Specialist coatings (waterproofing and flame retardancy) will diminish over time and with usage. A fantastic tent. 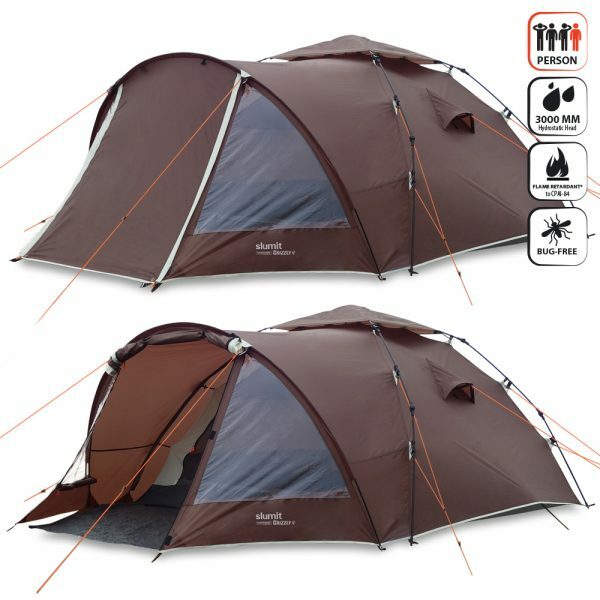 I bought this tent for a weekend away at the MotoGP at Silverstone with my son. We are both 6 foot 4 and there was plenty of room for us both. The weather was very wet, windy with thunder and lightening to the extent the racing was cancelled. The tent was very sturdy in the wind and did not leak at all even in torrential rain. Very easy to put up and take down would highly recommend. Bought this item for August bank holiday. This is my first tent. It is easy to set up as same as the demo does. It was sturdy during the first night with 28km/h wind. The only problem is the rain proof is not as good as it says 2.5 times of the British standard. The inner side of outer layer did get wet after a light shower. 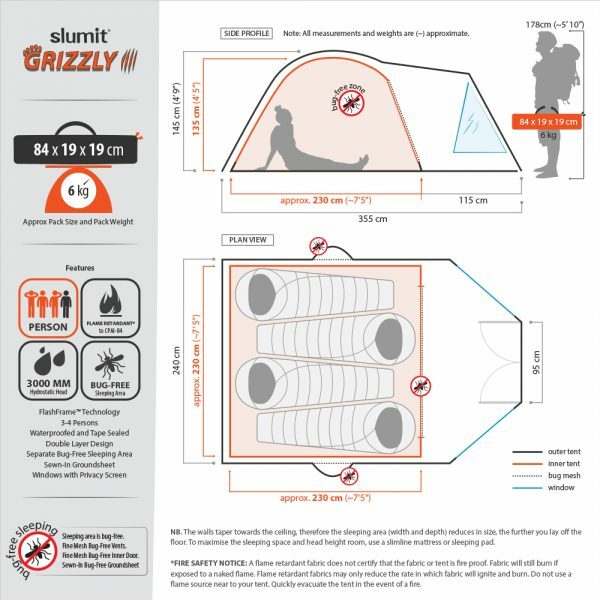 Slumit’s Response: Thanks for choosing the GRIZZLY for your first tent, and we are pleased to hear your tent kept you safe in windy conditions. Further to your review, please find we have also emailed you with further information, guidance and copy of the Initial Setup Guide. What you describe is condensation. Condensation is commonly mistaken for a leaking tent. Condensation will form on the inside of the outer rain-fly. Unfortunately there is little that can be done to avoid condensation inside a tent. Condensation will vary based on pitch location, temperature, the number of people sleeping (and exhaling warm air), how ventilated the tent is during use plus more variables. Full details on condensation is supplied in our How-To guide. Condensation in single layer tents can be a big problem, however our tents are double skinned (breathable inner tent, and separate outer rain-fly) to help minimise condensation dripping back inside the tent and the sleeping area. Hope this reassures you Wanyu and we’re happy to answer any questions you may have. Thank you for your support. Great tent. Does exactly what is says on the tin. Stuck in a windy downpour and kept bone dry.